The sellers have purchase elsewhere and are ready to meet the market! All offers are to be presented! There are many, many highlights to this acreage property. The wide verandah elevated to catch the breeze and with retractable blinds for year- round use. The huge games room with beautifully crafted bar. The self- contained guest quarters with its own driveway, kitchen, bathroom, WIR and carport. The oversize triple garage with toilet and entertaining deck to pool. The 10m x 7.5m 3 bay shed with power. You truly have to see this property to appreciate it. 93 Tierney Drive is an entertainer’s dream on a 3278m2 block and so close to the beach. 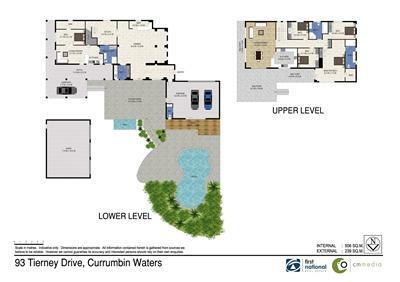 This perfectly located home is one of the closest acreages to beautiful Currumbin Beach, convenient to The Pines Shopping Centre, St. Augustine’s, PBC High School, John Flynn Private Hospital and easy access to the M1 Motorway. With plenty more features not listed here, please email or call me and I will send through the inclusion list with more relevant information.